KINGSTON, Jamaica – Sporting Alert – Here is the schedule and points standing heading into the fifth and final day of competition at Boys and Girls’ Champs 2016 on Saturday, March 19. The action on Saturday’s all-finals day gets under way at 1:00 pm local time, 2:00 pm ET and the final event is scheduled to go off at 8:50 pm. A very tight contest is expected to be the main highlight on the boys’ side on the final day, with Jamaica College, Kingston College and Calabar all well positioned to take a stab at winning the title. In boys’ team rankings, Jamaica College are the leading heading into the final day of competition. After 17 scored events, JC head the pack with 102.5 points, with Kingston College, who led before Friday’s closing day, dropped to second place with 101 points. Defending champions Calabar are not sitting in third place with 93.5 points and lots of big points to collect on the final day. Completing the top five are St. Jago High (63pts) and Petersfield High and St. Elizabeth Technical High (32pts). Rounding out the top ten are Excelsior High (29) Munro College (25), Herbert Morrison Technical (23) and Wolmer’s Boys (15). 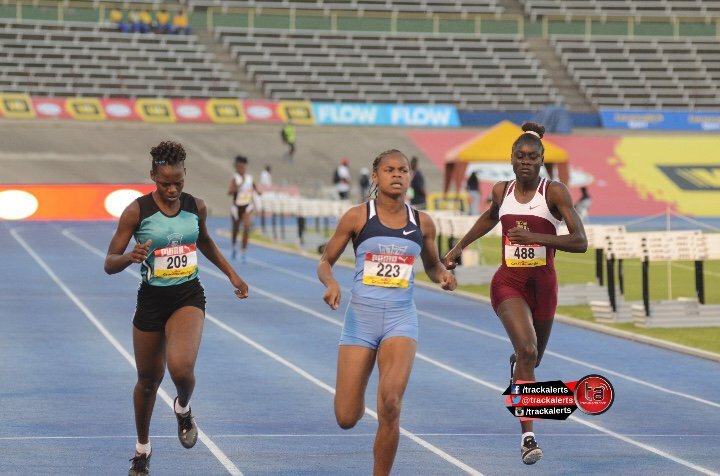 On the girls’ side, defending champions Edwin Allen High are running away from their rivals, as after 20 finals, they have 142 points in the team rankings, which is 39.5 points more than second place Hydel High, who are on 102.5. St. Jago High sit third on 89.5 points, with former champions Holmwood Technical High (68) and Vere Technical High (58) rounding out the top five. Excelsior High 45.5, Wolmer’s Girls (33.7), St. Andrew High (21), Convent of Mercy Alpha (18.7) and St. Elizabeth Technical High (18) are the top five teams in the girls’ team rankings.